Earlier this year Reuters reported that the top leadership of the Mormon Church is not only aware of the fact that Mormons are “leaving [the Church] in droves,” but the leaders “really care” about the situation. Additionally, ex-Mormon discussion and support groups have popped up all over the Internet. In answer to the “I’m a Mormon” ad campaign produced by the LDS Church, former Mormons produce their own videos explaining, “I’m an ex-Mormon.” Similarly, an interested investigator might visit both the “Mormon Scholars Testify” website and “Ex-Mormon Scholars Testify.” Clearly, people are actively leaving Mormonism and looking for something better. It is admirable that so many ex-Mormons make themselves available to others who are struggling with doubts about their Mormon Church membership as well as the transition out of Mormonism. While a lot of what is available for exiting Mormons is helpful, much of it leaves out the very thing that would be the most help to these hurting people: a living relationship with the Gentle Healer Himself, Jesus Christ. It’s heartbreaking to see exiting Mormons go through periods of feeling betrayed, disgusted, angry, confused and, finally, so spiritually despondent that many abandon faith altogether. They have left the “comfortable” atmosphere of Mormonism for a world that is a total mystery to them–and they have no idea how to navigate through it. “…to my great surprise, my Bible studying led me away from the LDS church and not toward it. Within six months of attending the ladies’ Bible study and tenaciously studying even more on my own, I found myself really and truly out of the LDS church—heart and soul. Making the Journey is a very practical book, addressing very real questions born of belonging to the Mormon Church. From discussing various issues related to the Bible (e.g., “Can I Trust It?” “Which Version Can I Trust?”) to church-related questions (e.g., “Which Church is the True Church?” “Why Go to Church at All?”) to doctrine (e.g., “Who Am I?” “Who Is God?” “One God, Three Gods”) to understanding the place of law in a Christian’s life (e.g., “The Sabbath, the Word of Wisdom, and Other Bits of Legalism”), Katrina’s answers are soundly built on a scriptural foundation and written in language former Mormons will understand. 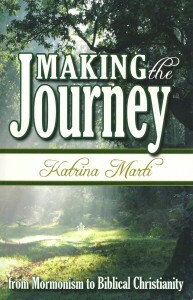 Unusual for a Christian book written for Mormons, Katrina does not quote Mormon leaders or other Mormon sources. She assumes her readers, as former Mormons, already know what Mormonism teaches. They, like Katrina, have lived it. Katrina’s goal is not to help her readers better understand Mormonism, but to remove any barriers that might keep them from placing their hope and complete trust in Christ. Katrina has made the difficult journey from Mormonism to Christ; through her book, she is ready to walk with you all the way to the foot of the cross. This entry was posted in Truth, Honesty, Prayer, and Inquiry and tagged Truth. Bookmark the permalink. Not to say that the Catholic church is a cult, but my years up until the age of twenty, really shaped who I was. A good deal of that time was spent in Catholic school. I often joke that a large part of me is still Catholic; for good or bad. So people don’t get over some aspects of their religious experience easily. I’ve reconciled and come to peace and gave-up my anger (specifically) a long time ago. But the Church has also changed significantly. When we start deconstructing and pulling things out of our life that are huge, we have to replace those things with something. It takes time. It’s a learning and emotional process. The hard thing is when people get stuck in one of the stages of recovery. so damaged by false prophets. but ex-Mormons FOR JESUS that is counts. Massive difference. Praise God for Katrina . Interestingly, the “I’m an ex-Mormon” site consists of mainly videos of people who were unhappy with Mormonism because they were gay, transgendered or otherwise “unaccepted” by the rather stringent morality practiced by Mormons. Few seem to have been motivated by a rejection of the doctrines of Mormonism, though I suppose some are. It’s unlikely they will be accepted any better by Fundamentalist Christianity. Mormons leaving the Mormon church. There’s more on this issue if you care to look at it. I think Mormons kid themselves into thinking that people leave Mormonism primarily because they couldn’t cut it one way or another because of the moral code. Mormons just can’t bring themselves to think that people would leave their beloved church because they found out the whole program is bogus. It’s the “church is perfect” mentality that devoted Mormons believe. There can’t possibly be someone who was in the program and found it to be false. The entire concept is too threatening. The party line goes that people left because they were offended by someone or they fell into sin. The other part of that is that people who leave, will in six months time, find themselves in serious sin. It’s instructive that there are a variety of methods by which people, who aren’t buying Mormonism any more, are subject to. Of course they are going to go to hell for leaving. Since Mormons don’t believe in hell there’s a separate entity called “outer darkness” invented just for apostates. If that doesn’t work there are all the other pressures that come from the Mormon authorities and family members who shame, ridicule, threaten or shun those who dare to leave the Mormon system. We often quote the statistic that two-thirds of those on the rolls of the Mormon church are inactive and that fifty percent of returning Mormon missionaries go inactive. That’s a lot of people being offended or who have supposedly fallen into sin. Maybe Mormonism needs to do some soul searching to figure out what’s wrong with the Mormon program that so many of their own find it unacceptable. Mike R: I don’t doubt that many are leaving and many are disillusioned. Was just noting that the ex-mormon videos seem to be overwhelmingly those who would NOT fit in a traditional Christian church, either. Falcon: To borrow a phrase, there is NO church that is perfect, “no, not one.” And while Mormonism is quite tightly-knit (and a person’s ties to it, usually from birth, likely makes it extremely hard to part with) we have acknowledge that leaving a traditional Christian church or denomination is tough, too, and that members who remain often put pressure on those who are uncomfortable there, and believe them to be hell-bound. I think I can do a pretty good job of providing testimonies regarding Mormons who have left and the concerted effort by the leadership and members to pressure them to return. I haven’t had much experience with Christian churches doing the same. I left the Catholic church when I was twenty and no body, not my family or the clergy tried to guilt me back into the fold. You referenced “traditional” Christian churches. They’d be about the last group that would pressure someone to stay. To-be-sure there are some groups that I would call “cult like”, that might get into that, but I can’t identify any right off the top of my head. I think the technique that you are using here is pretty typical of Mormons. It’s the “see everybody does it” charge. No everybody doesn’t do it! 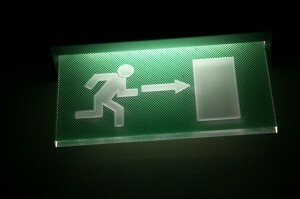 Mormons pester the daylights out of people who leave. With the churches I am familiar with, that sort of tactic would be considered inappropriate and at the level of stalking. I agree with Falcon on the issue of churchs not hounding people when they leave. The past few churchs I have attended, and the one I am currently with, have never chased after people to return. The thinking in general as far as I can tell, of the churchs I have been with goes like this. Some people leave because they move far away. That makes no sense to chase them. Some people leave to go to another Church, they figure for what ever reason their needs are not being meet where they are or they simply disagree with something. So if thats the case, we wont chase them, since what good would it do to talk them into staying someplace where thay are not happy being. We would rather see them grow in Jesus at a church where they are being helped. Lastly, some people leave simply because they want to return to the world and enjoy a sinful lifestyle. If this tends to be the case, we again dont waste time or effort to hound them to come back, we figure if they get tired of chasing sin they will return, if they dont, then we want to focus on the people that do want Jesus and we try and help them since they want to know and grow in Jesus. Why chase after people who will say, Leave me alone I want to live in sin. But this is only how I have noticed things, their can and could be other scenarios out their. I’m trying to think of a traditional Christian church that teaches that if people leave that denomination, they are going to go to hell. I think the Amish teach that but I wouldn’t consider the Amish a traditional denomination. Now here’s the point. Don’t miss it. People obtain eternal life through faith in Jesus Christ and His finished work on the cross. People don’t gain eternal life by attending a certain religious denomination. They don’t go to hell based on where or by what means that got baptized, for example. Mormonism is a religious system that (Mormons) believe will allow them to become gods if they are obedient and true to the system. In the Mormon system, their god, isn’t even all that important, in my opinion. That’s why Mormons get their underwear in a bunch when someone leaves the system. Even people outside the Mormon system are guaranteed a certain level of reward within Mormonism, according to its beliefs. The Good News isn’t proprietary. No Christian denomination holds a franchise on obtaining eternal life. That’s not so with the restored gospel of Mormonism. Mormons do believe their religious system holds the key to achieving the highest level of reward, that is personal deification. The Mormon system franchise has the secret handshakes, the secret passwords and of course the all important Mormon male priesthood. Without these things, Mormons believe, a person is sunk as far as getting to the top of the spiritual ladder of success. In fact, truth be told, the only way to really get to the top of the pyramid of religious success in Mormonism is to practice polygamy. The FLDS are the only ones who qualify according to Joseph Smith’s teachings. Jesus is the pathway to the Father. He is the means by which we obtain eternal life. Mormonism is basically (its own) sacramental religious system that sells indulgences that people suppose will result in a pay-off; personal deification. The “sacraments” are the temple rituals and the 10% paid into the organization garners the temple recommend (the indulgence). Sacramental churches believed that they were the means, the dispensers of God’s grace. They believed they were the pathway to eternal life; that they held the keys. People were enslaved to the religious system. The pureness of God’s Word tells us that we have direct access to the Father through Jesus. We don’t need a special church office or an absolution for sins administered by a church approved clergy. What we need is faith. Faith in Jesus, the qualified Savior, is the key to eternal life. A changed life reflects that faith. God dispenses grace to us first to believe and then to persevere in our commitment to Him. No one can live the victorious Christian life without God’s grace. This grace is readily available to those who God draws to Himself. Mormons are trapped in a religious system that is tough to expunge from the mind and spirit. It is through God’s grace and the ministering of His Word that people who have been damaged by Mormonism can find healing. Who would trade a relationship with Jesus for a religious system? I am happily married for soon to be 24 years, mother of three, work part time, I love the true and living Christ of the Bible, the traditional Christ I never knew as a Mormon, I also love camping, fishing, scrapping, traveling, I’ve researched LDS doctrine, teachings and history for many years and found it to be false, made up and deceiving, I’m not gay, transgendered or otherwise “unaccepted” by the stringent morality taught by Mormons and I AM AN EX MORMON! Where do I sign up to make a commercial?!! I just love how what people do on the outside is so important to Mormons. Actually it’s none of their business but this is what happens when you set yourself up by believing that the LDS church is the “only true” church on earth. This is what happens in a legalistic religion bound by so many rules and regulations made up by men to control you. Maybe Mormons should look to their own backyard and leave everyone else’s alone. I live in a LDS community and believe me, everyone is minding everyone else’s business. Where is Jesus in any of that? So what if someone is gay or transgendered or “otherwise”?? That is between them and the Lord. Just like my sins are between me and the Lord. Yes, even Mormons sin. Shocker I know! Let’s take the LDS man who is married and put his name on LDSsingles.com and was dating my friend, she texted him and his wife answered! My friend was horrified! This man was living a double life, is he otherwise “unaccepted” by the stringent morality taught by Mormons? Is his sin any more acceptable than someone who is gay or transgendered? I was born and raised LDS, I was LDS for 40 years. When I left the LDS church I sent in a resignation letter stating that my records be removed immediately and a confirmation letter sent immediately. I also stated that I wanted absolutely NO contact from anyone in the LDS church. I received a letter from church headquarters stating that it was an ecclesiastical matter and had been sent to the stake president and my bishop. I then received call after call from the ward clerk which I never answered ( thanks caller ID!) I knew what he wanted. One day I answered a number I didn’t recognize and it was my bishop calling from his work. He proceeded to interview me over the phone. Of course he asked me if someone had offended me. I told him I had done the research and the LDS church isn’t what it claims to be and I don’t believe a word of it. It took THREE MONTHS for my name to be removed! Who removed it? The same guy I initially sent the letter to! Finally I received a confirmation letter and four days later Mormon missionaries were at my door. There was a pamphlet from the first presidency with my confirmation letter which was basically spiritual blackmail. I tore it up and threw it away but now I wish I would have kept it so I could share it on here. I have since had missionaries show up here several times. What part of NO CONTACT does the LDS church not understand. It’s been awhile since I’ve attended my Christian church and absolutely no one has put pressure on me. I haven’t left the faith, just been busy. Kate, if the missionaries continued to show up at your door – KNOWING that you had left the LDS Church – then, yes, that is definitely harassment and inappropriate. Sharon, you make a few statements in your opening paragraphs that do not directly apply to many who have left the LDS church. I think it’s important to note that while many do follow the route you have sketched, others do not. You state: “It’s heartbreaking to see exiting Mormons go through periods of feeling betrayed, disgusted, angry, confused and, finally, so spiritually despondent that many abandon faith altogether.” This is perhaps where my personal experience diverges from your post in the most fundamental way. I did abandon faith (not just in the sense of ‘the Christian faith’, but as a concept entirely), but that was step one. One moment I was a believing Mormon, the next an atheist. I experienced none of the emotions you describe as part of that transition. At no point did I feel spiritually despondent. You seem to be making the case that Christians should make an effort to fellowship those individuals transitioning away from the church, and try to guide them to biblical Christianity. My point is only that not all experience that transition as you have described. I don’t believe that at any point I have been especially receptive to the messages of biblical Christianity. At no point was I asking myself questions that biblical Christianity would have been in a position to answer satisfactorily (to me at least). I also have an unrelated question. Periodically, on some of the ex-Mormon discussion boards, you’ll see people asking where those who leave the church end up. As I’m sure you’re aware, the boards mostly seem to be biased towards atheism. Many who maintain theistic beliefs find the boards less than welcoming. My personal theory is that those who leave the LDS church for different church are more likely to find community in their new church than in the boards. And those who leave the LDS church for non-belief are more likely to seek community on the boards. My suspicion is that the non-religious bias of many of the boards is not representative of reality. On the boards we see a high percentage of atheists, but I suspect a much higher percentage end up some form of Christian. What is your experience? Do an abnormal percentage of ex-mormons end up non-believers, or do the majority end up Christian? Mossface, thank you for your comment and observation. I have no doubt that there are people (in addition to yourself) who transition away from Mormonism without experiencing spiritual despondency. Most of my interaction with ex- or exiting Mormons, however, involves those who have a very difficult time of it. As a Christian who believes the answer to every essential question is to be found only in Jesus Christ, I do think that He is “the very thing that would be the most help” to all people, hurting or otherwise, who are currently living without Him. So you are correct in suggesting that it seems that I would like to encourage Christians to reach out to exiting Mormons (as well as everyone else) in order to point them to Jesus (and biblical Christianity). I hope that if you come to a point in your life where you are looking for answers different from what you’ve embraced, you will be receptive to the central message of biblical Christianity — that Jesus Christ has come to seek and save the lost. I know from personal experience that the Lutheran Church in Finland do tell the people that leave their records for another church apart from the Roman Catholic Church, that they are going to hell if they continue. And the people that do leave the Lutheran church for any other church except the RC, are usually ostracised by family and friends (usually friends) and left to find new friends in their new church. I served my mission in Finland and heard many stories about this from LDS members and people that did not join the LDS church but joined another Traditional Christian church, or SDA or JW. So even though you may not have come across it, it does happen and in large numbers. Another thing that the Lutheran church does there is if the local minister finds out that someone is researching into another religion or denomination, they go out with an ‘expert’ on that religion/denomination and try and talk some sense into them. So while they may not hound the person after they leave the Lutheran church, they hound them before the person leaves and once they have left, the majority of leavers find themselves alone without family or friends. And they do teach that the leaver will go to hell if they leave. That is unless the person is joining the RC church. But that was a bit over 20 years ago, things may have changed since then. Here’s the problem. The mission president, stake president, and bishop of the ward I live in, all know I have left the church. They send every new set of missionaries that come to our area. The missionaries have no idea that I have resigned, they think I’ve never been LDS. I have had to explain it to them every time. I know they are being sent here for me because my husband and kids have not had their names removed yet. I think it’s ridiculous for the leaders in this area to keep sending these kids unaware of the situation, knowing that I have requested in writing NO CONTACT. Yes I am being harassed by the LDS missionaries but I blame their leaders. It’s very annoying! I’m surprised that anyone in Finland still goes to church. Religion in Europe isn’t high on people’s list from what I understand. I’m not buying the idea that mainline Christian churches pursue folks who have left. It just doesn’t happen in my part of the world. As for stephena’s claim regarding the Assemblies of God telling people they are going to hell if they leave, I haven’t encountered that either. My wife have relatives in this particular group and I’ve been in and around the AG folks and it’s not apart of their culture. Mormonism makes a concerted effort to badger people who have left. The religion is based on control and conformity. I think Kate has provided us with some first hand experiences regarding this and her situation is not unique. Most of the Finns were hatch, match and dispatch church goers when I was there. But if I understand correctly, the Lutheran church being the ‘state church’ had kickbacks from the government according to number of members, which is possibly why they tried to keep hold of them. I could be wrong on that, but that’s the understanding I got while I was there. I was going to mention the fact that many of these churches are supported by the state. That’s why the founders of our nation where so adamant about the freedom of religion. They had witnessed how corrupting it can be for the government to be playing favorites when it comes to religion. Given what you said, the motivation for what the Finnish church was doing had more to do with money than concern over someone’s eternal destiny. The Mormon church is facing a similar problem as more and more members formally have their names removed from the rolls or merely go inactive. It’s very difficult to keep up the money flow if people are dropping out and there isn’t the same number to replace them. This is the problem that Mormonism faces today. How can the Mormon church retain members and thus keep the coffers full of cash? What happens is that people discover that the Mormon church isn’t what they’ve been told it is. The challenge is to keep people in the fold and suitably indoctrinated so that when they find out, for example, that Mormons believe in a different god, a different Jesus and a different gospel, they won’t jump ship. One Mormon writer proposed that Mormons cut back on their efforts to get new converts and try to solidify what they already have. There are people who buy-into the Mormon program, like yourself Ralph, and who wouldn’t leave no matter what the evidence; holding on to some nebulous “witness of the spirit” or “personal experience” as the primary evidence that Mormonism is true. As the topic of this thread points out, many who leave the Mormon church have difficulty reconciling what they have come to know about the Mormon church with their indoctrination and not so subtle religious mind games. They can’t retain members, but I’m wondering if this is the reason for the multibillion dollar mall that was just finished in SLC??? They have to try and make up the lost tithing somewhere. My guess is that these guys are pretty good with money although it’s tough to tell because I think they keep those records under lock and key along with Joseph Smith’s magic rock. Money is the mother’s milk of LDS Inc. It’s one of the reasons I would guess they built all the McTemples as they became known. The estimates were that these mini-temples were getting paid off pretty quickly because they could now be reached by more Mormons. Figure it, in order to get a temple recommend, a Mormon has to be up to date on their tithe. So when there’s an opportunity to actually get into the swing of the full-on Mormon program, temple work, the folks have to be paid-up to the organization to get their ticket. This would naturally increase the flow of cash. Now my understanding is that temple garments are sold by the organization so if there’s an increased need, sales will go up also helping the bottom line. Early Mormonism had some bad pub with a failed bank, that many of the faithful took a bath in, economically speaking. They even tried a little socialism which also didn’t work out too well. So the organization turned into full on capitalists and have done very well. Where they run into trouble is in these countries where they can have some success in recruiting but the people have zero cash. It becomes a drain. I’ve also seen where they’ve had to do some consolidation due to low numbers in some areas. The boys who sit in the big chairs in the tall building in SLC know the score. They talk lofty “spiritual” talk but with an eye on the bottom line. I have asked the Mormons on this blog many times, Where is the love? I see no love of Christ in the Mormon Church, not even the majority of the average Mormons. The song is based off of the verse in 1st Cor, If I have done all these things, but have not Love, what good am I? My paraphrase. Here is a link to the video, I believe it is Lyrics and song only, from You tube. Then after watching or listing to it, ask your self, Do you have and show Christs Love? If you say yes, then please explain it to me, since it has never been done before. And If I honestly say, I dont see it, then maybe you should ask yourself, are you showing the love of Christ to those of us who are non LDS and are asking for answers? this article hits some of the same points even though it’s not Mormonism. I’ve been watching the National Geographic series on Tuesday nights. There are many, many Mormons who haven’t been to the temple for whatever reason (word of wisdom problem, spouse not ready, etc. ) but they still pay a full tithe. I would guess the LDS church gets as much if not more money from these people than temple going Mormons. In my opinion, the LDS leaders don’t really care if the new converts go to the temple, just get them baptized and paying tithing. Pres. Hinkley was asked in an interview once about the financial records being closed and he said it’s because only the tithe payers have a right to see them. I wonder if tithing Mormons would get a copy if they asked for it? I doubt it. It would be interesting to see just what the multibillion dollar corporation has their hands in. I think some would be absolutely shocked. Something’s up, or there would be no need for such secrecy with the financial records. I would ask Mormons how they can trust leaders who aren’t completely honest and forthcoming about where tithes go.